There's another world beneath the ocean's surface. Come join, us as we explore The Depths Below. The earth cracks open. Fluid and minerals spew up from the seafloor. Water shimmers. Life abounds. We're looking at hydrothermal vents, originally discovered near the Galapagos Rift in 1977. Basically, a hydrothermal vent is a hot spring produced by underwater volcanoes or tectonic activity. But what's really cool about them is the abundance and assortment of life that exists there. 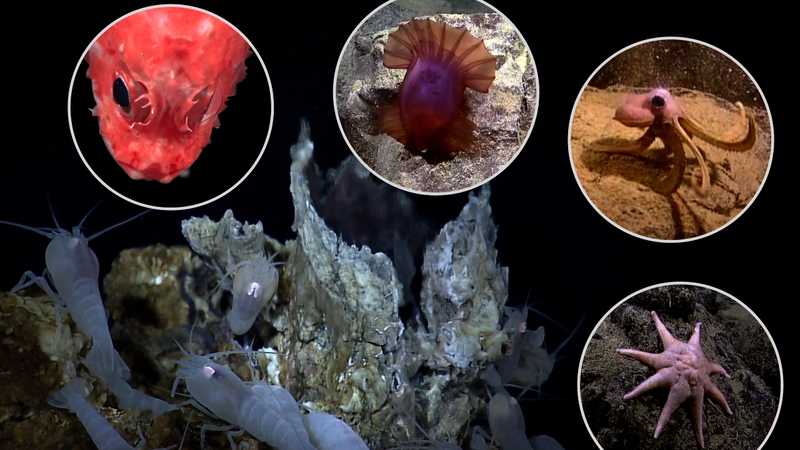 It's not life like we're used to up here on the surface – it's adapted to the dark conditions of the deep ocean. Organisms that live around hydrothermal vents don't rely on sunlight and photosynthesis. Instead, bacteria and archaea use a process called chemosynthesis to convert minerals and other chemicals in the water into energy. This bacterium is the base of the vent community food web, and supports hundreds of species of animals. What kinds of animals? Well, scientists on the NOAA ship Okeanos Explorer went to the rift in twenty-eleven. And here's just some of what they saw. Riftia tube worms, also called giant tube worms, which can grow to their full size of almost five feet long in less than two years. Bathymodiolus deep sea mussels, which are often the first creatures to colonize the vent and are able to survive for a short time after the vent is inactive. Serpulid, or “feather duster” worms, and tevnia tubeworms, which are often the food of choice for vent crabs, the top predator of the vent community. But it's not all animals down there. Researchers also saw white flocculent material erupting from the vents like a snowblower - an indicator of microbial life beneath the seafloor. And of course, there were the fresh lava flows, which means the seafloor is continuing to change. And that change, means there's always more to learn. So join us, as we continue to explore The Depths Below. The Gulf of Mexico Outer Continental Shelf (OCS) provides about 25% of our domestic natural gas and 30% of our domestic oil. Fifty percent of leased acreage in the Gulf of Mexico OCS is in deep water (greater than 1,000 feet).